I've started to notice a trend among these well-aged Orphan Barrel offerings--they are consistently dry bourbons with prominent wood overtones. 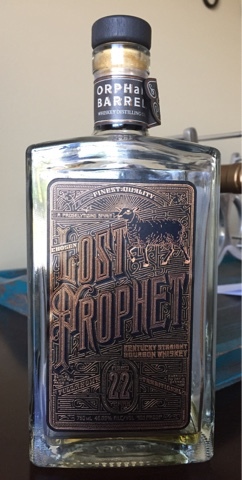 Lost Prophet is a prime example, and, unfortunately, that's about all that this bourbon initially offered by way of a flavor profile. The nose left much to be desired (and I'm one who generally enjoys the smell of my whiskey, even when the taste may not do much for me). It was strong in alcohol and wood and not much else. On my first pour, the flavor matched the nose. Although the burn was minimal, the alcohol in this bourbon was very noticeable, and the dry, woody flavor did little to soften this alcohol flavor. Unlike most other bourbons, there was almost no sweetness to this bourbon, and I was looking for it. I tried to find some hints of vanilla, toffee, caramel, etc. buried in there somewhere, but it just came out harsh and bitter. I did notice an almond flavor that seemed to somewhat parallel the woodiness, but this just wasn't enough to balance it out or make it very enjoyable. So, I put the cork back in and placed it back on the shelf, hoping it might open up a bit and perhaps soften the bitterness. After leaving it on the shelf for a few weeks, I finally went back to the bottle and was pleasantly surprised! The bitterness was pretty much completely gone. The wood tones had balanced out, blending with a chocolate flavor that was completely unexpected. After sitting on this for weeks in between pours, I found myself looking forward to the next. This is one of the more striking changes in a bottle after it's been open a while that I've ever noticed. Initially I was not a fan. I had higher expectations after trying Barterhouse, and this one left me disappointed. However, after it was open for a bit and the bourbon likewise opened up, I found this to be a very good, well-aged bourbon with a great blend of sweet and savory that made me wanting more. This bourbon almost deserves two grades. I'd give it an initial grade of C-, but a later grade of A-, which was the bulk of my pours. Accordingly, it ultimately receives a B+.